Lying to the north of Carloway (home to an Iron Age broch) on the west side of Lewis, “mhor” means big and “beag” means small in Gaelic. Both beaches have access by road, although Dalmore has better parking and toilets. The impressive Atlantic rollers make Dalmore a must for the experienced surfer. Ness is a perfect choice for families as it has both wet and dry day activities, including a sports centre with ten-pin bowling alley and Europie play park, situated on the western shore and built into the dunes. Visit Ness Beach while the tide is out to enjoy the sandy beach and rock pools. Bosta Beach lies at the top north-west corner of Great Bernera, which is accessed via a bridge on the B8059. An added attraction is the restored Iron Age house, part of an ancient settlement which came to light after gales in 1993 laid bare a section of the dunes and exposed evidence of dwellings buried beneath the sand. Follow the road for Tolsta at the northern end of the B895, where you will find several stunning beaches. 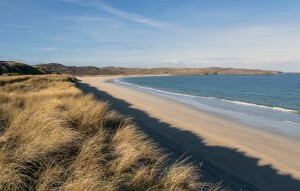 The long beach, Traigh Mhor, comprises 2 miles of unspoilt white sands and is popular with surfers. Garry Beach, separated from Traigh Mhor by a small rocky point, may be smaller but with its sea stacks and caves (which you can explore when the tide is out), it is one of the most exciting beaches on Lewis. There is also a good coastal walk over the Bridge to Nowhere, built by Lord Leverhulme in the 1920s and intended to carry his proposed road from Tolsta to Ness – a road that was never built. This beach is located just off the main road north to Tolsta, approximately five miles north-east from Stornoway. Suitable for walking, wind-surfing and kite flying. The main access to Ardroil Beach is through the village of Ardroil on the south side of Uig Bay. 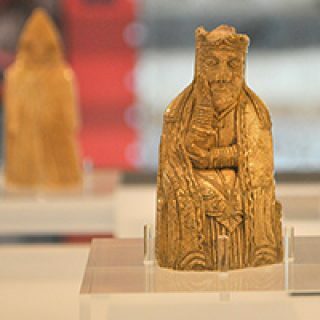 On the way to the beach you will pass a large wooden statue of a chessman, which celebrates the discovery nearby in 1831 of the famous 12th century Lewis Chessmen. 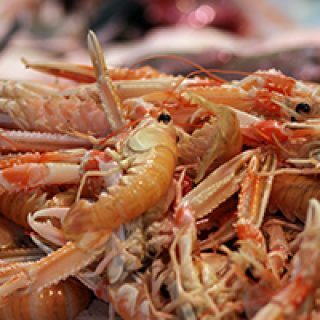 Also explore the beaches north of Uig Bay such as Kneep, Valtos and Reef Beach. 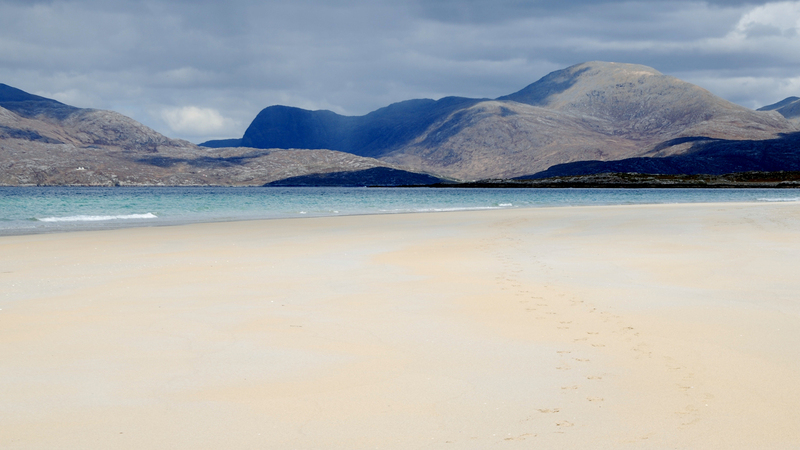 These three beaches can be found by turning right off the B8011 and turning right at the end of Loch Roag. A single track road leads you past the white Uig Parish Church to a junction. The road is a large loop that ends up back at the church, passing these beaches along the way. Seatrek at Uig also run exhilarating boat trips if you fancy exploring this stunning stretch of coastline from the water. A couple of miles north of Tarbert on the main road that runs the length of Harris is a junction signposted west to Huisinish on the B887. This single track road is your gateway to one of the most glorious 15 miles of scenery with the bonus of Huisinish Beach at the end. The white sands and aquamarine waters at Huisinish are overlooked by a cluster of crofts and cottages with views across the Atlantic to the now uninhabited island of Scarp. Luskentyre is one of the largest and most spectacular beaches on Harris. Named as one of the UK’s best beaches in TripAdvisor’s Travellers’ Choice Awards, Lukentyre boasts miles of white sands and stunning turquoise waters. Take the A859 south from Tarbert for 8 miles then turn right at the sign for Luskentyre. Continue on this single track road that follows the bay and ends at a car park near a cemetery. From here there are paths through the dunes to the beach. Seilebost is perhaps best seen from the main road above the south side of the bay. Here you can really appreciate the view, with expansive sands and aquamarine sea contrasting with the darker mountains of Harris beyond. Access to Seilebost, the southern beach, is not that easy. To reach the sands it is best to take the minor road to Luskentyre (as above). The largest beach on Harris, Scarista is easily reached from various points off the A859. It comprises three miles of pristine sands and enjoys dramatic views over the Sound of Taransay to the island of Taransay.